Are Silos Destroying Your Business? Strategic thinking can help you defeat the Meeting Menace. Here are three tips on holding more effective meetings with your team. For more detailed information on leading strategic meetings, check out the new business graphic novel, StrategyMan vs. The Anti-Strategy Squad: Using Strategic Thinking to Defeat Bad Strategy and Save Your Plan. Can StrategyMan Save Your Plan? Video: StrategyMan vs. The Anti-Strategy Squad book trailer. 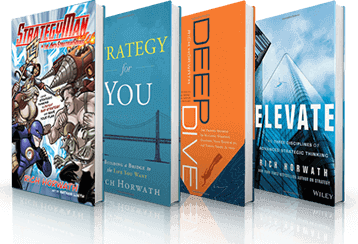 See what can be learned when a strategy textbook and superhero comic book collide. When is a Strategy Not a Strategy?